ps - Thanks to my 365 friends for voting this to the TOP TWENTY ! This is a really lovely image despite the winter snow. What a fun shot! So unique! 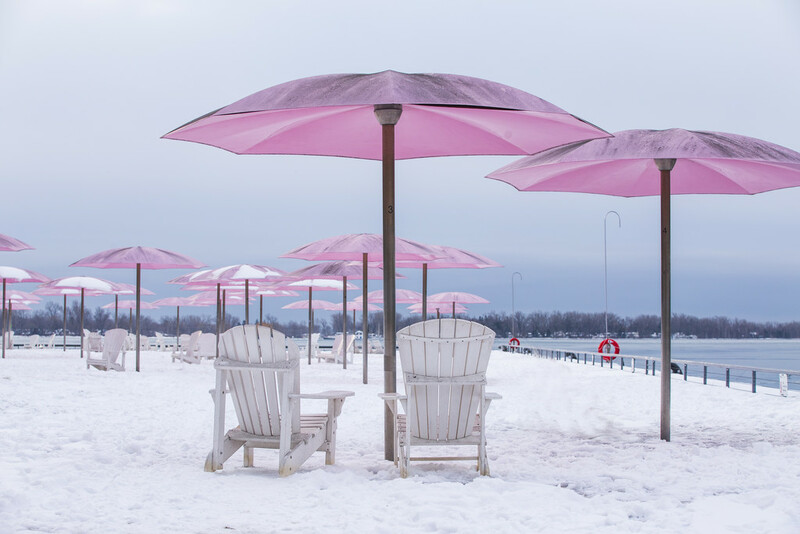 Love the snow and the pink umbrellas! Still makes me want to go to the beach!! Such an unusual scene and stunning image, fav! Oh my gosh, sun umbrellas and snow? What a combination. Love the Snow umbrellas! Can’t help but wonder why they’re up in winter. What an incredible shot. In Maine we say if you can't endure the winter you don't deserve the summer. For people who enjoy snowbathing! Fav. Amazing for those foolhardy enough !! makes for a wonderful scene though ! Love the pink umbrellas..........definitely very inviting right now! So funny, love it. Have family in Canada and been a constant visitor over many years so enjoy these photos "with a difference". Love the tones very inviting! Fav ! Lovely shot. Lovely colors. A fav. I am longing for warmer temperatures. I love the pink umbrellas. Excellent shot. Lovely image, I had to look twice to realise it was snow on the beach! Why do they have umbrellas up in the midst of winter? So it's going to be snow castles! Good shot. Wow, amazing image. The pink and white are amazing and you even have some pink in the sky. Oh yes....the best of both worlds! What a fantastic image. Great job, Peter. A beautiful scene and beautiful soft colors. What a wonderful and unique image. This is fantastic -- big smile and instant fav! Grand colors and as Taffy said...grins! My favourite Camus quote! This beach in the snow raised a big smile. Something very candy floss about it! Looks like summer in winter a wonderful scene to find and capture Fav. Lovely scene and capture fav! there is such an intriguing, bizarre quality to this..the pink sun-umbrellas with the snow....and of course you have done this with perfect light for the scene. @stevepam - Hi Steve-Pam - what do you mean by "sute"? Thanks for the link. Will watch it later. Thanks for the link... beautiful images and well written! Fav. Stunning image. Looks like a ladies' haven with all that pink. WOW - absolutely stunning tones and image! Big fav! A beautiful and unusual shot - fav! Love the pink umbrella's! That sugar sure looks an awful lot like snow! LOL!! Looking forward to Summer myself! Fabulous image,love the pink I did have to look twice at the sugar.